Welcome back to Something About Coins! 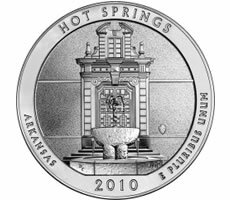 The U.S. Mint's uncirculated Hot Springs 5 oz silver coin sold out, and several details about the upcoming ceremony to launch the Grant $1 Coin surfaced today. A couple of South African coins made the news, and a few class descriptions for ANA's Summer Seminar are listed. The story behind the counterfeit 1969-S doubled die Lincoln cents is also retold. Enjoy!